My clients ... man, are they incredible!!! 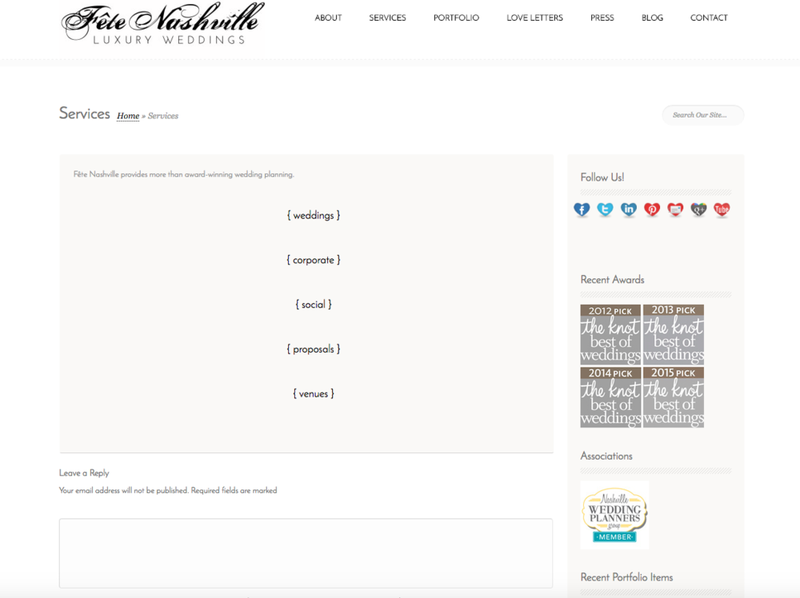 Yesterday I launched a website for an Australian tv personality and fashion blogger and today I am announcing the website launch of my design for Fête Nashville who plans weddings for celebrities like Shawn Johnson and has Rascal Flatts sing at her planned weddings!! Craziness. Sara Fried, owner and founder of Fête Nashville was inducted into The Knot Best Of Weddings hall of fame and she is ahhhhhh-mazing!! She hired me because she wanted a website that reflected all that awesome and I was more than happy to deliver! 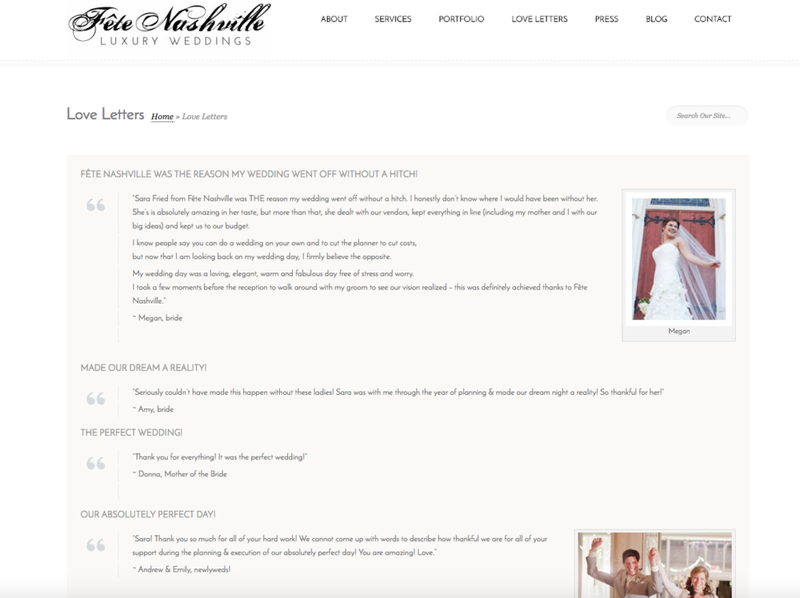 Sara and I discussed lots of ideas for her new website and one of the most important parts was letting her luxurious weddings speak for themselves - a stripped down website that allowed the visitor to see just enough to contact her, but not too much to feel overwhelmed and chaotic. I believe we found the perfect balance and I love what was created for their online face. Fête Nashville has two galleries: one for real wedding photos and one for the real wedding video clips :) Below is a screenshot of the gallery landing page for the videos .. what I love even more is that when someone does go into a page from here they can click through the rest with the click of the mouse! Let's get those page views rolling!!! Sara, I loooooooove your new website!!! SO pretty!! SO impressive!! I can't wait to see what this new website does for Fête Nashville! Congratulations!! More Blogs Posts To Click On!